State, business and health leaders have launched an initiative aimed at connecting Kentuckians recovering from addiction with employment services. “Reworking Kentucky,” a component of the chronic substance abuse and addiction program Recovery Kentucky, expands assistance and support to individuals who are exiting the program. It will help them obtain an entry-level, workplace-ready assessment from a local Kentucky Career Center and secure employment with a participating partner company, according to a press release from Gov. Steve Beshear’s office. Gov. Ernie Fletcher created Recovery Kentucky in 2005. In 2008, Beshear established the Recovery Kentucky Task Force, a 21-member panel created to ensure the continued effectiveness and financial success of the Recovery Kentucky program. First Lady Jane Beshear, a member of the task force, developed the idea to strengthen the ties between the Recovery Kentucky Centers, Kentucky Career Centers, and statewide and local employers. Under Reworking Kentucky, Kentucky Career Center staff will work with individuals to develop a plan for employment including any individualized supports needed and will regularly discuss progress with the individual, making adjustments to the plan where necessary. The individual will also be provided appropriate guidance and counseling concerning the implications of their disabilities (substance abuse and any co-existing disabilities) on their ability to search for, obtain and maintain employment. After graduation from Recovery Kentucky, individuals will work with staff members to identify possible employment and training options for the individual with participating employers and training programs. Participating statewide and local employer partners will ensure the availability of employment opportunities for participants regardless of home location. The individual will still complete an interview, attend an orientation and complete the normal hiring process within the company as appropriate. 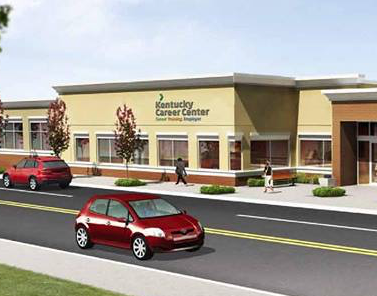 The Kentucky Career Center staff will be a resource for the individual throughout the assessment and employment process, and will work with a designated human resources manager/coach within the company to follow up on progress. Jane Beshear encourages the local business community to use Recovery Kentucky and Kentucky Career Centers to utilize a whole new pool of potential employees under Reworking Kentucky. “You will find the Recovery Kentucky graduates to be hard-working, dedicated and committed to improving themselves and their communities,” she said. A 2014 report, from the University of Kentucky Center on Drug and Alcohol Research, shows that individuals who enroll in substance abuse programs at one of the state’s 14 Recovery Kentucky centers are more likely to abstain from drugs and are less likely to spend time in jail. The report also found significant cost savings attributed to Recovery Kentucky center participation. Every dollar spent on recovery services resulted in a $3.59 return in avoided costs to the state. Savings are attributed to tax dollars that would have been spent on unemployment services, health aid, public safety and other services the state provides for substance-dependent individuals. Connect to the Northern Kentucky Career Center for more information.